Well, we should have known that we couldn’t make it through an entire winter! But at least we have 40s coming within the next few days, so we know it’s not going to stick around long. This is what it looked like around here this morning. I took this picture around 11 and you can see that the flakes are just starting to come down. We only have a couple inches so far, but it’s supposed to snow into tomorrow, so we will probably have a good amount of snow before the storm moves on. I am looking on the bright side – tomorrow is March 1st, and we will be seeing green grass soon! We got our new table yesterday. Now we just need a small tablecloth and we are all set. Also, our new door was put in today. Tom reused the trim from the old door so it would match the other doors in the hallway. He does such great work! The only thing left for Harry to do is stain the door and paint the trim inside the office. And there goes one more item crossed off that list! We’re finished with the painting in the office! It feels so great to have this painting finished. You can see the door to the office in the picture – it now has a cat door (for the moment!). Yes this is the door that was originally the door to the basement. On the door that was originally here on the office, there were some white rub marks that I had not been able to get out. Well, yesterday Harry had an awesome idea! He switched the office door with the hallway basement door. Now the white marks that were showing on the face of that door are inside at the top of the basement stairs. And when the guy comes on Wednesday to replace this door, he won’t have to work around our alarm system or the basement steps. A win-win-win resolution! So back to today…while Harry was working on the painting, I was using the refinishing polish on the trim and doors in the other downstairs rooms. You may recall that we discovered this stuff last year when we were getting the condo ready to sell. Well, I just used the last of the can we bought last year this morning. We have already picked up a new can. The wood is so dry. The Restor-a-Finish polish really brings out the grain of the wood. Then I use a Feed ‘n’ Wax Wood conditioner to finish the process. There are A LOT of doors and other wood surfaces in this house. I hope I can get the polishing finished within the next couple of weeks. These weekends go TOO fast! We are now getting to the point where we can say that we are doing the finishing touches on the various rooms. We’ve done all the biggest parts of each – painting the walls, redoing the floors, cleaning out most of the furniture. After completing the big jobs, we moved on to the next room to do the same, just leaving those little items to complete. The office is almost finished. Harry will be working on painting the ceiling this morning while I am at work, and then we have the trim to paint. Thankfully, in most of the house the trim was not painted. But for some reason, when Harry painted that room years ago, he painted the walls and the trim the same color. So, since we had to do something with the trim, we bought a small can of a darker shade of the wall color. That is the only painting we have left to do in there. I should have pictures by tomorrow! So – now this is the plan. Once the office is finished, we are going to start going room by room, and completely finishing each one. I think those small finishing touches will go relatively quickly, and it will be so good to knock all those little things off our list. We have been hoping that we could get the interior of the house pretty much done during the winter season, and I think we are on track to actually achieve that goal. One other item being taken care of this week – the door to our basement is being replaced. Our current door has a cat door in it, as our cats’ litter box used to be down in the basement. We know a hole in the basement door would not be an asset during the selling process, so we went and picked up a new door a few days ago. The guy who did our kitchen last year is coming on Wed. to rehang the new door. Another finishing touch! That list is getting shorter all the time! We heard from the repair place yesterday, and lots of good news! The work is progressing nicely. We originally took it there to have the slide adjustment done. They have already taken care of that, and said that the slide was out of alignment more than was visible to us. So it’s a good thing that Harry’s eagle eye noticed the lack of sealing at the top of the slide. In addition to the slide adjustment, we decided to take care of a couple other items now, since we were taking it to a repair place anyway. The biggest one is a pin box upgrade. I’m sure that a lot of you know what I’m referring to when I say that we have not enjoyed the whiplash type of jerking one feels when traveling on roads that have expansion joints running across them. So Harry and I have been talking since last year about having an upgrade done, and have now decided that there is no time like the present! Harry also is having Diederich’s do some regular preventative maintenance as well. They are repacking the axle bearings, and they also installed wet bolts on the suspension system. All of the above has been completed except for the pin box upgrade. They ordered the MorRyde, and it should be in next week. So hopefully by the second weekend of March we can head over and pick ‘er up. Both Harry and I will be glad when the fiver is parked in our driveway once again. One of the benefits of making plans to travel to a campground in our home area is simply that – it is close to our home. So, on Monday, as it was another beautiful day, we decided to take a ride over and check out two of the campgrounds we are traveling to in the upcoming season. It was really a gorgeous day, and relaxing, and we enjoyed the nice views as we traveled through the countryside. Our first stop was the Copake KOA. It was all closed up, so we weren’t able to see much from the road. But we are glad that we made the trip. While the roads are passable with the fiver along the route we took on Monday, there were a lot of winding back roads. So we are going to make another trip over some day going along the highway, just to see which route we would rather take. Our second stop was the campground where we will be going for a few days in July. That trip will be very easy – straight shot along a good road. This campground was deserted but open, so we drove through and took a quick look around. Obviously, at this place there are a number of people who check in and never check out. We had a great time and enjoyed our quick trip. It really made us SO ready for camping season to get underway. Only 87 days until our first trip of the season!! …is not the best way to spend a weekend. So, with that in mind, we mixed a little of both in for today. It was another absolutely beautiful winter day, with a gorgeous blue sky and a high in the 40s. These days have been the norm rather than the exception this year. So far this is the 2nd least snowy winter on record since they have been keeping track of such things. And I’m not complaining! We started out the day by getting back to work in the office. Harry sanded down the spots on the roof where he had spackled. Once he finished that, we both got busy finishing the first coat of the paint, and moving on to the second. He also gave the bathroom closet shelves a second coat of the white. In the next couple of days, we should be able to get that bathroom closet put back together. It’s going to look a lot more roomy as I have pitched a lot of what was in there. Harry doesn’t seem to have minded the wait. After a great meal and our stop at the store, we headed back home to finish the painting in the office. It’s all done except the edging near the ceiling. What a great feeling! We still have the trim to do, and the ceiling needs to be painted, but the majority of this room is done. We should have it finished by next weekend! We are happy that we have another day off from work tomorrow. We were busy beavers today, filled with new energy now that we can see the finish line to our home improvements. As usual, I had my 6 hours of work to get through. While I was gone, Harry worked on the finishing touches in the bathroom. He caulked along the edges of the tub, the sink, and primed the shelves for the bathroom closet. He also took the rest of the painters tape off in the bathroom, and cleaned the trim in the office. No pictures of Harry’s work as those were all the kinds of jobs that add the needed finishing touches, but aren’t really able to be viewed in a photo. Once I got home, I got busy finishing up the taping in the office, and then we headed to Home Depot for what we hope could be one of our last gallons of paint. It was still wet when I took these pictures, so it will lighten up somewhat as it dries. We hope to be able to finish this room tomorrow. In case anyone is missing hearing about this, here are a couple photos from this day last year…. No word yet from the repair place on the fiver. We are hoping to hear early next week, but are somewhat relaxed about the timing since it is only the middle of February. Even so, I am sure Harry will be calling if we don’t hear something soon. Today we took a short trip – to the service place. It’s hard to believe, but it has been over three months since we were last out of our driveway with the fiver. And we were going to the same place! I took one last picture of our full driveway as we were getting ready to head out. We had an uneventful trip, but it all felt new again, and we had to get used to the feel of being out on the road and towing! Both Harry and I will be happy when we have a number of trips under our belt. 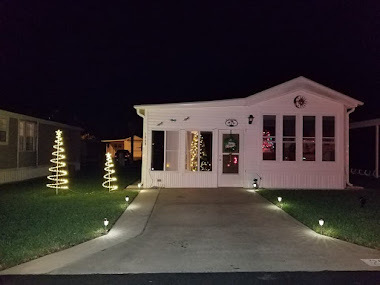 Since we came back from TN last June, we have only been out of our driveway three times! It seemed so strange to drive out and leave ‘er behind. But we are both glad that we are getting this work done long before the spring season gets here. Our driveway looks so empty, through the dusty windshield. One great thing for today – Harry brought out the hitch cover we got at Christmas. Our hitch has been in the garage all this time, but now we can leave it right on the truck. We should hear something tomorrow or the next day from the service guy. And hopefully soon we will be heading back to bring ‘er home. We continued our productive weekend with another great day today. Outside was a little chilly, but in here, we were busy getting stuff accomplished! Since yesterday I have listed and gotten rid of…a desk chair, a portable crib and all its contents, 2 cordless blinds, and a portable stereo system. I also worked in the office some more. I cleared off this entire shelving unit. Both of these shelves were covered this morning. Now, not only are they empty, they aren’t hanging on the wall! I have these shelves listed on freecycle. Hopefully I will get a taker soon. Here is the office after my day of sorting. Those boxes under the window aren’t filled. One is a keeper box and one is a box that will be going into storage. There isn’t too much in here that we will be keeping. This room is almost ready for painting. While I was sorting and pitching, Harry was working in the downstairs bathroom. He started out by applying the second coat of paint to the areas he had touched up, and the closet. This closet is not easily painted. But it looks great with the fresh coat! Harry had to be a contortionist today when he was installing the new faucet set in the vanity.